Lagos, Nigeria, July 14, 2014 – Travelstart.com.ng, an online travel agency in Nigeria, today announced its partnership with Dana Air, which will allow customers to book domestic flights on their online travel booking platform. This collaboration gives Travelstart an exclusive third-party distribution rights for Dana Air flights and thus, giving the airline a broader distribution influence in Nigeria travel market. 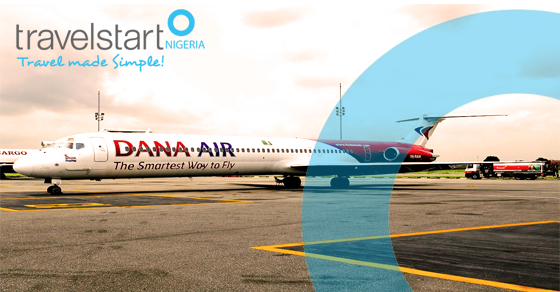 Beforehand, passengers could only book Dana Air flights on its website but under this partnership, passengers can now book Dana Air flights on Travelstart Nigeria website. The alliance is seen as a major move to offer cheap airfares and easy flight booking to the domestic travellers who often fly within the country for personal or business purpose. Since its launch in 2012, the online travel agency has witnessed significant growth in terms of domestic travel sales. According to Travelstart’s internal data, domestic flight bookings increased by 46.9 percent in 2013 and 49.35 percent from 1st of January 2014 up to now compare to total flight bookings in 2012 and this shows the growing popularity of Travelstart.com.ng among Nigerian travellers. Through this collaboration, passengers will now benefit from a variety of domestic travel deals and cheap flights from Dana Air on Travelstart.com.ng. This partnership will also enable customers to get full access to Dana Air Flight Information via Travelstart Search Engine. Travelstart Nigeria offers easy payment options for travellers to cater for their needs. These payment options include, EFT from Nigerian banks, Credit Card, Quick Teller and of course, Cash can be made at Travelstart office.